South America is a continent which boasts an incredibly diverse experience, from the bustling streets of Sao Paulo in Brazil, to the breath-taking beaches of Chile; there really is something for every type of traveller. With so much to offer it can be easy to get overwhelmed with choice, so we have hand-picked a couple of the most incredible sites not to be missed if travelling through South America. Located on the border between Peru and Bolivia, Lake Titicaca is the largest lake in South America. Taking a boat trip on the lake will give you a better picture of just how vast this body of water really is and soaking up the scenery on the water is the best way to do it. The lake is home to the indigenous Uros people, who still to this day live on manmade reed island clusters on the lake itself. The reeds which supply the Uros with material for their island homes, is also used for building their houses, cooking utensils and jewellery. The Bolivian side of the lake is home to the Isla del Sol (Island of the Sun), with no roads on the island it is not the easiest place to navigate, but with nearly 200 Inca ruins dating back to the 15th century it really is a destination not to be missed. 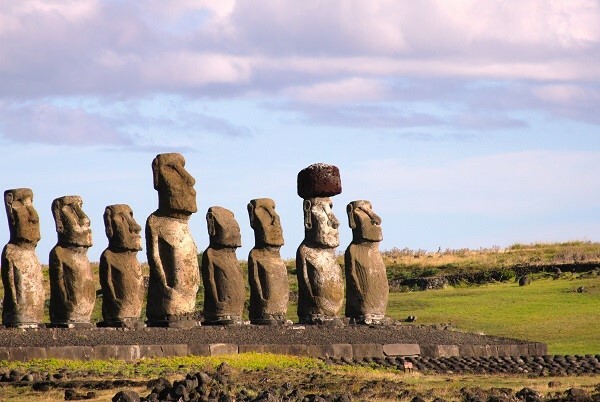 The mysterious Easter Island has captivated travellers for generations, drawing tourists from all over the globe to see the famous Moai Easter Island heads, the origin and construction of which still puzzle experts to this day. While it is well known for its archaeological importance, there is much more to discover than the ancient statues. The beautiful landscape is ideal for hiking and trekking for lovers of the great outdoors, with a host of trails taking you from the beautiful coastline to the edge of Rano Kau, an extinct volcano towering above the island. The island itself is relatively small, and takes just two full days to visit all the archaeological sites it has to offer. Once you have explored the ancient statues and ruins, there are two beautiful white sand beaches on the island. Anakena, on the north of the island is perfect for body boarding and surfing, and Ovahe, which is surrounded by breath-taking cliffs not far from Anakena. Sitting 7,000 Feet above sea level resting on a mountain top between the Andean Mountain Range, Machu Picchu is considered the main tourist attraction of Peru and one of the Seven Wonders of the World. One of the best ways to truly experience the ruins is to follow the Inca Trail which meanders through the Andes. The 28 mile trek combines incredible mountain scenery, tropical forest and ancient tunnels and ruins before finally leading you to the ancient citadel. While the hike itself is not overly intensive, due to the high altitude and low oxygen levels, it can become a lot more difficult. It is wise to take this into consideration when planning your trip. Patagonia is a land of true extremes. From endless grassy plains and stunning coast lines to breath-taking glaciers, it is a true wonder. The diverse scenery has long been a popular destination for would be explorers and holidaymakers alike. For those looking to take in the beauty of the area the Perito Moreno Glacier is the picture postcard shot. Appearing as a wall of ice, the glacier is one of 48 glaciers fed by the Southern Patagonian Ice Field located in the Andes system shared with Chile. No list of South American wonders would be complete without including the highest waterfall in the world. Located in the heart of the Canaima National Park in Venezuela, the falls tower an incredible 979 metres above the dense jungle below. The falls are so high that by the time the water reaches the ground, it becomes tiny water particles and often turns to fog. While the top of the falls offer breath-taking views across the park, the base of the falls should not be missed either. Arguably the best way to experience the falls is to take advantage of the dugout canoe trips which are available following the Carrao and Churun rivers taking you to Ratoncito Island, where the falls are located.